Last fall, ARPA-E Program Director Dr. Mike Ohadi led a workshop to explore innovative, high efficiency, modular electricity generation systems. You can read more about Dr. Ohadi’s background, what brought him to ARPA-E, the original goals for the workshop and some initial post-workshop thoughts in the original blog here. Having gained a better understanding of the challenge of efficient heat transfer, Dr. Ohadi sat down to chat about how his thinking surrounding both the problem and solution has evolved—and how the broader research community could help find a solution. Keep reading to learn more. After more research, what have you learned from the community? How has your thinking changed since the workshop? In earlier conceptions of this potential program (including at the workshop) I was very focused on the full suite of technologies required to enable next generation power cycle systems. This included developing high temperature heat exchangers and turbomachinery, as well as cycle design and analysis. Upon further reflection, outreach, and discussion, it became clear that certain components were more critical, and faced more fundamental challenges, than others. Rather than spread resources thin, I decided to focus the research on what appears to be a key limiting factor in development of high efficiency power generation systems: heat exchange. Following the workshop, I realized that we need to get back to fundamentals. This means taking a look at developing the key enabling technology required for next generation, high efficiency power cycles: high temperature (above 800°C) and high pressure (above 80 bars) heat exchangers. And not just developing this technology, but doing so in such a way that they would be compact, durable, cost-competitive, and manufacturable. If we can develop them, these high temperature, high pressure, efficient heat exchangers would enable more efficient power systems and could lead to substantial energy savings across a wide range of industries. For instance, an application could be in a new generation of highly compact electric generators that could power hybrid-electric aviation engines—which would be the first major shift in aircraft propulsion since the jet engine. Another potential application is in next-generation nuclear reactors, which will need components that can withstand the high temperatures and pressures needed to transfer heat from very hot reactors to generators. 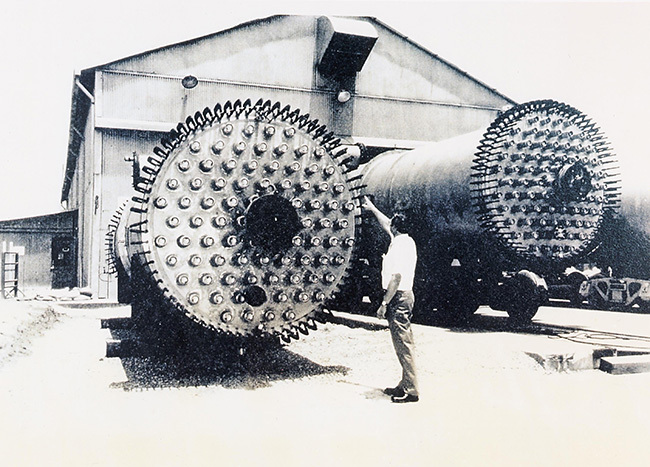 An old-school industrial heat exchanger. Photo: Department of Energy. Going forward, what would focused research on this topic area look like? Handling both high temperature and high pressure is an ambitious goal. Materials can behave differently when under that kind of stress, leading to faster degradation and more frequent breakdowns of components, neither of which is sustainable in practice. A challenge like this requires synthesizing input from across disciplines, from materials science, to manufacturing, to novel design topologies, into one tightly integrated package. Today’s state-of-the-art commercial heat exchangers rely on materials like as 316 stainless steel, which lose much of their mechanical resistance at temperatures approaching 700°C, rendering them unsuitable for high temperature operations at high pressures. While so-called super alloys and ceramic materials have sufficient mechanical strength at high temperatures and pressures, they are challenging to manufacture into the forms needed to achieve efficient and intense heat exchange while minimizing the resistance to flow. Given these challenges, any future initiative should prioritize substantial design, material, and manufacturing research and development in creating innovative heat exchangers. In particular, development in manufacturing processes and machines would be needed to realize high-quality parts with very fine features, at a reasonable throughput speed, while minimize the defects and as such improving the cost affordability. Research in this area would also impact platform development for other Department of Energy efforts, including the DOE Supercritical Transformational Electric Power (STEP) co-sponsored by the Fossil Energy, Nuclear Energy, and Energy Efficiency and Renewable Energy offices. I encourage all interested parties to subscribe to the ARPA-E newsletter to stay in the loop on future happenings on this and other topic areas. ARPA-E today issued a funding opportunity announcement (FOA) of up to $35 million for the High Intensity Thermal Exchange through Materials and Manufacturing Processes (HITEMMP) program, to develop new approaches and technologies for the design and manufacture of high temperature, high pressure, and highly compact heat exchangers. The deadline to submit a concept paper for HITEMMP is 9:30 a.m. ET on September 12, 2018. Additional information, including the full FOA and how to find project teaming partners, is available on ARPA-E’s online application portal, ARPA-E eXCHANGE.